Water Fountains need to be accurately controlled to assure proper and continued function. The level of water required to keep the fountain from either running dry or overflowing is very important to monitor and maintain. Low water can cause pump damage or fountain failures, while floods from overflowing can be even more disastrous. We could help cover all that…and much more. Fountains are usually in a public place, where you want the equipment out of sight…and touch, not in the view of onlookers, taking away from the experience. 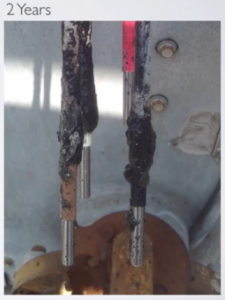 Our sensors can be located in an external static well to remove the sensing probe from sight. You also need a safe system. Our sensors run on low voltage and low current. In fact, all of our products are ETL Listed to the industrial Controls UL Standard 508. You can check out our Fountain Systems here. What Kind of Sensor is the Best? Ask our customers! We recently spoke with a fountain Contractor/Supplier in Los Angeles and got a great testimonial we thought we’d share. 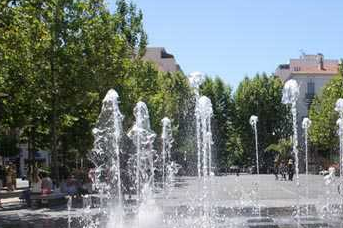 While attending to a fountain he had the chance to observe a Waterline electronic sensor. He was surprised by its appearance, thinking it look new, when he knew it was not. 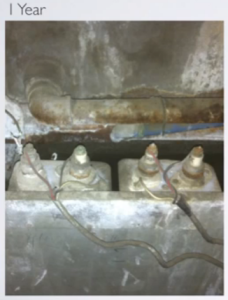 He said it had had our controller and sensor for 20 years and “it looks like it has never been in the water, it was so clean.” Ever seen the corrosion on conductivity probes or the pitting that occurs? Our sensors don’t suffer from that. We use a sensor that contains multiple stainless steel probes that are inserted into the liquid being measured. tips of the probe look new! You also need to control your water supply. 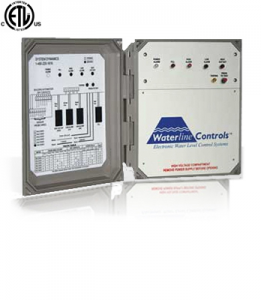 Waterline controllers are designed to operate 110VAC solenoid valves and connect into a larger control panel to let the pool or fountain operator know what the water level controls are doing. Building Automation System– With BAS connection capability our revolutionary software driven solid state electronic controllers are the cutting edge for water level control. We have systems with High & Low Alarms and Low-Low Basin Heater Cut-off, for fool-proof operation. Testing is simple and intuitive, with just a push of a button. And some great parts they are. With little maintenance, low cost, long life and integrated firmware for hassle free operation, we think we have the only system you’ll ever need for keeping a beautiful and expensive water fountain running economically, safely and automatically for many, many years to come. Back that up with our industry leading 100% satisfaction guarantee and you simply can’t lose!